If you have trouble getting things done, try scheduling them out. 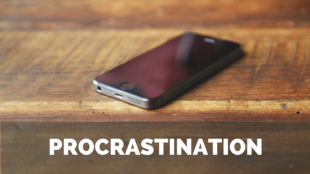 Designate a specific timeframe in your day to complete the task, and set an alarm on your phone. If it’s a project you’re truly dreading, sandwich it between two more favorable activities, or ask a trusted coworker/family member to remind/hold you accountable for finishing. Give yourself a carrot. Tell yourself that if you finish a blog post, you’ll get to watch an episode of House of Cards, or each snack equals one completed spreadsheet. If you make a certain deadline, you’ll get to relax when you arrive home instead of panicking. If that isn’t enough, give yourself a stick! You won’t let yourself listen to NPR on the commute home, etc. If it’s a habit you’re trying to start, keep track of the dates you accomplish said habit in a visual manner. This could be through something as simple as a calendar with x’s, or as high-tech as an online to-do list. Once you have a streak going, you will be more reluctant to break it. So what are you waiting for? Carpe those diems (and noctems if need be), and help your business fight procrastination in the workplace!